A new study published online today in Nature shows that corals on the northern Great Barrier Reef experienced a catastrophic die-off following the extended marine heatwave of 2016. "When corals bleach from a heatwave, they can either survive and regain their colour slowly as the temperature drops, or they can die. Averaged across the whole Great Barrier Reef, we lost 30 per cent of the corals in the nine month period between March and November 2016," said Prof Terry Hughes, Director of the ARC Centre of Excellence for Coral Reef Studies (Coral CoE). The scientists mapped the geographical pattern of heat exposure from satellites, and measured coral survival along the 2,300-km length of the Great Barrier Reef following the extreme marine heatwave of 2016. 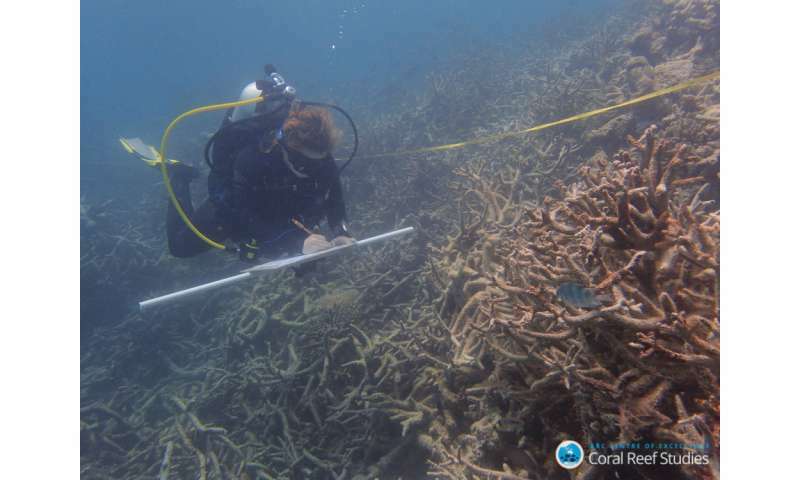 The amount of coral death they measured was closely linked to the amount of bleaching and level of heat exposure, with the northern third of the Great Barrier Reef being the most severely affected. The study found that 29 per cent of the 3,863 reefs comprising the world's largest reef system lost two-thirds or more of their corals, transforming the ability of these reefs to sustain full ecological functioning. "The coral die-off has caused radical changes in the mix of coral species on hundreds of individual reefs, where mature and diverse reef communities are being transformed into more degraded systems, with just a few tough species remaining," said co-author Prof Andrew Baird of Coral CoE at James Cook University. "As part of a global heat and coral bleaching event spanning 2014-2017, the Great Barrier Reef experienced severe heat stress and bleaching again in 2017, this time affecting the central region of the Great Barrier Reef," said co-author Dr Mark Eakin of the U.S. National Oceanic and Atmospheric Administration. 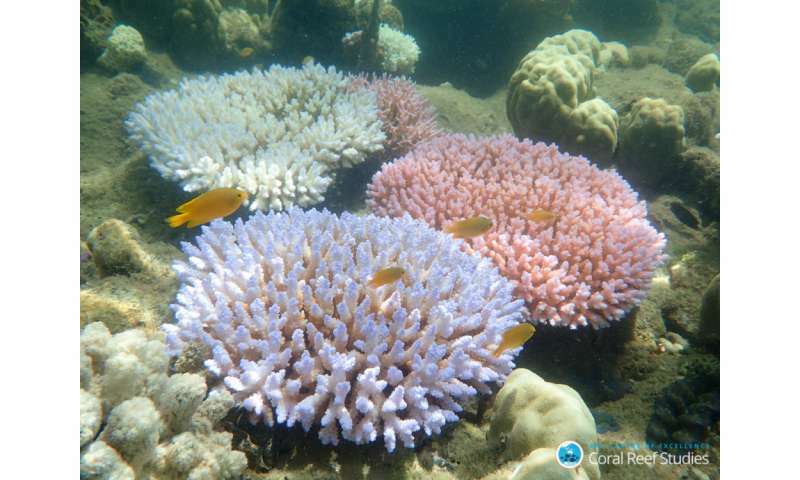 "We're now at a point where we've lost close to half of the corals in shallow-water habitats across the northern two-thirds of the Great Barrier Reef due to back-to-back bleaching over two consecutive years," said Prof Sean Connolly of Coral CoE at James Cook University. "But, that still leaves a billion or so corals alive, and on average, they are tougher than the ones that died. We need to focus urgently on protecting the glass that's still half full, by helping these survivors to recover," said Prof Hughes. The scientists say these findings reinforce the need for assessing the risk of a wide-scale collapse of reef ecosystems, especially if global action on climate change fails to limit warming to 1.5?2 °C above pre-industrial levels. "The Great Barrier Reef is certainly threatened by climate change, but it is not doomed if we deal very quickly with greenhouse gas emissions. Our study shows that coral reefs are already shifting radically in response to unprecedented heatwaves," said Prof Hughes. The researchers warn that failure to curb climate change, causing global temperatures to rise far above 2 °C, will radically alter tropical reef ecosystems and undermine the benefits they provide to hundreds of millions of people, mostly in poor, rapidly-developing countries."